Although there have been a lot of changes and discussions surrounding football-related injuries and concussions, the fact of the matter is that the game will still be played. As early as four or five years old, boys (and even girls) are playing football and engaging in the dynamics of the sport on some level. Once our children reach a certain age, tackle football is almost always required in order to pursue a career in the sport – be it college, professional or semi-professional. The risk of injury and concussion remains the same for all ages and all levels of play. In fact, high school football players quite possibly run a higher risk of concussion due to the fact that they are not trained quite as extensively as college and/or professional players are trained. We can equivocate that to the philosophy that recreational players are less experienced, and therefore play less carefully. Helmet impact is the leading cause of concussions in football. We know a lot about these statistics, and we know that a lot of players suffer from CTE (chronic traumatic encephalopathy, a progressive degenerative brain disease linked to head trauma) post-career. There is much debate about CTE and whether or not it is directly associated with football impacts, however, we do know that there are many head, neck and brain conditions suffered by former players. Research shows there is a staggeringly high percentage of former players who report signs of depression, anxiety, dementia, behavioral or mood symptoms, impulsivity and cognitive symptoms such as memory loss and executive function. Because we know that the sport will go on, regardless of protocols and awareness, we can – and should – be advocates for the safety of our players. It’s a little-known fact that helmet and uniform modifications can be made to potentially decrease a player’s risk of concussion and/or injury. A product that reduces the G-force impact of helmet to helmet hits has the potential to change the future of a football player. Mayfield Athletics (a Detroit, Michigan based company) designed and developed SAFEClip, a clip that replaces the standard issued facemask clip. SAFEClip reduces the G-force impact by up to 28 percent with every hit. SAFEClip reduces the risk of short and long-term effects from repetitive blows to a helmet. Facemask's have come a long way since being introduced into the NFL in the 1940’s. ZUTI Facemasks has created a new facemask that is more shock and energy absorbing, resulting in better safety. The ZUTI facemask offers more flexibility and strength, while it also protects the facial structure of players. It is also designed and constructed with a stainless steel structure with no welds –which means there are practically no fail points unlike traditionally welded, and standard issued, facemasks. If a player loses their helmet during a tackle play, there is a significantly higher risk of head injury from a helmeted player. Wegener Safety Latch is a product that you attach to a helmet’s existing chin strap. It virtually eliminates the possibility of a helmet loss. 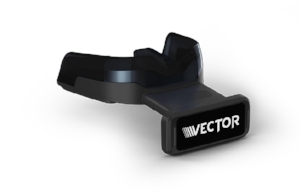 With technology integrations at the forefront of nearly every industry, it’s no surprise that a product like Vector Mouthguard is being introduced to the game of football. When worn by players, this mouth guard tracks hit counts, locations, and severity of impacts in real time. It’s paired with a platform for coaches to view results, so that player technique can be modified and athletes sustaining impacts within concussion thresholds can be identified during play, resulting in safer game play. We love football. It’s a pastime favored by masses of people in countries all over the world. Even when we visit another country, we see the locals wearing their favorite American NFL team jerseys and cheering in sports bars. Football will always be a part of our culture, but so will advancements in engineering and technology. When we fuse the two together, we can create a safer, more enjoyable experience for our players, their families and the fans.